Never rent a car seat, say carseat experts. But there are times when you cannot bring your own child safety seat. When that happens, you'll want to take special care to make sure your seat is as safe as possible. I've searched the web, talked with car seat techs, and visited a several rental agencies myself to put together these safety tips for renting a car seat. Please suggest others in the comments. Call ahead: Verify that the company will have a safe, clean seat available when you arrive. Ask them what their policy is on the age of rentals and whether the seats are inspected regularly for safety. If you will need help, ask whether there is a trained car-seat tech on site. Know the Basics: Most agencies will not help you install a car seat for liability reasons, so if you have never installed a car seat before, learn how before you go. Know The Law: Car seat laws vary state-by-state within the US and are different internationally too. Make sure you know the law at your destination. Don't Go "Off-Airport": Try to reserve with an "on site" agency. That way if you run into problems, you'll be able to walk to another agency and try again. Have one parent wait at the airport with the kids while the other retrieves the car seat. When the rental agency is off-site there usually isn't a place to get the kids a drink or snack while you are waiting in line and installing seats. Also, if you run into problems, you'll feel less trapped if you don't have to load the whole family back in a shuttle and find another agency. Don't assume that someone at the agency has inspected the seats to make sure they are safe. Looking over the seat yourself takes only a few minutes and could mean the difference between an unsafe seat and one that is in good condition. 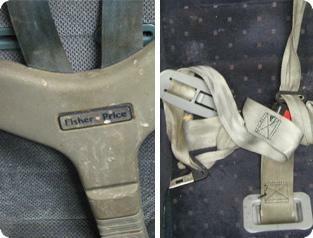 Inspect the Seat: Look for any evidence of cracking, twisting, worn harness webbing or broken buckles or other distress. Latch the seatbelt buckles and pull hard to make sure that they do not detach. Look for Latch: All carseats should have a "built-in" latch belt, and latch is the preferred way to install any seat. Check the Expiration Date: Find the "manufacture date" label on the side or back of the seat. To be on the safe side, don't use a seat that is older than 5 years. Most seats also have an "expiration date" stamped into the seat's plastic shell. Check The Size: Most car seats have height and weight information printed on the side. Make sure that the car seat is the right size to seat your child. Get the Manual: The car seat manual will help you install and use the seat properly. Most agencies attach the manual to the seat in a waterproof pouch, but some store them separately. If a manual is not available, you can ask the agency to download one from the manufacturer's website. Don't Be Shy: If the first seat you are given does not have a manual or is not in good condition, don't be afraid to ask for another one. In some cases you will be able to go in the storage room and choose your own. Look for seats that look newer (sometimes they are at the bottom of a pile or the back of the room). Check for recalls: Call the manufacturer or contact the Auto Safety Hotline at 888/DASH-2-DOT (888/327-4236) or the National Highway Traffic Safety Administration (NHTSA). Get Help From The Right Person: Ask whether there is a certified car seat technician on site to help you install the seat safely. Don't assume that other employees will have the proper training to install your child's seat correctly. Infant seat rentals seem to be especially tricky because most agencies don't include the car seat base that parents usually use at home. To make matters worse, it's very difficult to install an infant seat snugly without the base. Don't Expect a Base: Most agencies I visited rent infant car seats without a base. If you have never installed an infant seat without its base before, make sure to review the manual for instructions. Also note that without the base, you will need to re-install the sat each time it is removed from the car. Bring a Level and a Towel: In many cars, a baseless car seat cannot be installed securely unless you use something to level and support the foot of the seat. Most manufacturers recommend using a rolled up towel and many car seat technicians recommend using a "pool noodle" as an alternative. Few car rental agencies provide these devices, so you may want to bring your own. Try a Toddler Seat:: If you cannot securely install the infant car securely, consider renting a convertible toddler seat instead. Most can be installed rear-facing and many are designed to seat infants as small as five pounds. Be sure to check the manufacturers instructions to make sure the seat will fit your child. Don't Wedge the Seat: Some agencies recommend that you scoot the front seat back until it hits the infant seat, wedging it between the front and back seats and therefore securing it a little more snugly. Car Seat manufacturers disagree on whether it is safe for the front seat to touch the child seat (some recommend that there be a few inches of clearance between the infant seat and the front seat), so check the manual. Using the front seat alone to level the seat seems risky though (especially if the driver or passenger adjusts their seat), so make sure that you follow the manufacturers instructions instead. Send one parent to a nearby store to buy a carseat. You can often buy new for around $40. If the seat is marked with the agency's name, a photo of the marking. adrianne on March 12, 2009 at 8:48 a.m.
i'm going to be travelling to australia with my 11 month old baby girl next week. do you happen to know if i need to bring my carseat? we'll just be taking taxis and public transit. Lisa on August 8, 2009 at 11:54 a.m. I have now had two rental car companies (Hertz and Avis) promise me when I made the reservation that the car seat will be installed when I arrive, only to learn from the counter staff that they don't install the seats "for liability reasons." Debbie on August 8, 2009 at 3:41 p.m.
You are right, most rental car agencies will not allow their employees to install the car seats. Some Avis locations have a certified car seat tech on staff who will install the seat for you if you ask. Debbie on August 8, 2009 at 3:45 p.m.
You would not use a carseat on public transportation, but laws vary as to whether you would be required to use one in a taxi. Independent of the law, you should ask yourself whether you would be comfortable driving without a carseat at home - it's no safer in a taxi than it would be in your own back yard. Dona Richards on January 18, 2010 at 6:10 a.m. It's nice to know that there's a certified car seat tech who makes sure that the baby seat's safe. I'd like to install one when I rent a car in Israel. Thanks for this article. blockegon on October 4, 2011 at 10:10 p.m.
1- Is it safe to rent a car seat or other baby gear? It depends. It depends from whom you rent. It depends on what you rent. 2- How can I make sure that the equipment is safe? Word of mouth and reputation are key pieces of this equation. Ask your friends for recommendations and go from there. 3- What should I look for when renting baby equipment? Besides recommendations, look for gear brand reputation and manufacturing dates. It is not the price range or the appearance of the equipment that matters. For example, at the higher to mid-price range, car seats made by Britax such as Marathon and others have a high safety reputation. Graco portable cribs and pack n plays are highly regarded and some of their infants car seats are more popular than expensive brands. Car seats have a manufacturing date sticker attached to them. Make sure the seats are within the acceptable range before renting them. Many car seats have a 7-year lifetime. However, even charity organizations will not accept car seats older than 3-years. Therefore, you are better off sticking to their guidelines and only renting seats 3-years old or newer. 4- Are rental equipment items clean? Again, rental company reputation and recommendation from friends will serve you well here. However, when in doubt, ask the question directly. Car seats have removable covers and should be washed after each rental. A simple double rinse cycle wash in the wash machine with warm water and mild detergent followed by drying should do the job. No need for bleach. Other items should be cleaned in the same fashion. 5- Is it really more responsible to rent baby gear? "A principal determinant of fuel consumption in aircraft is drag. Drag is proportional to the lift required for flight, which is equal to the weight of the aircraft. As induced drag increases with weight, mass reduction, with improvements in engine efficiency and reductions in aerodynamic drag, has been a principal source of efficiency gains in aircraft, with a rule-of-thumb being that a 1% weight reduction corresponds to around a .75% reduction in fuel consumption. Now consider adding lbs and lbs of weight from luggage and other stuff, such as baby gear to that mix. 6- Is it expensive to rent bay gear? No. Rental companies offer very reasonable deals. Esmi Johnson on July 9, 2015 at 12:58 a.m.